Suitable for people who enjoy easy-paced walks or exploring the countryside on foot. Explore a land little-touched by the modern world as you journey through three of Bulgaria’s most beautiful mountain ranges, stay in charming villages and discover its absorbing culture and history. This trip is the perfect combination of mountain walking and culture. Everyday offered something different from wandering around traditional villages, to taking in the stunning views we were rewarded with during each walk! The local people were very friendly and helpful, I would love to go back and explore more of this fantastic country! This was my first visit to Bulgaria and it didn’t disappoint. It has so much to offer the keen traveller, I feel like I have only just scratched the surface. Its rich history was so interesting to learn about and interspersed with exciting mountain walking, this trip really is a great way to discover this emerging Balkan nation. Packed with historic attractions, pristine landscapes, wild mountains and delightful, welcoming villages, Bulgaria is emerging as one of Europe’s most appealing destinations, and this holiday showcases its highlights. Your holiday begins in begin in Plovdiv, the 2019 European Capital of Culture, where you tour the Old Town and walk the longest pedestrian street in Europe. Driving south, you enter the beautiful Rhodope Mountains staying in small, traditional hotels for three nights with time to fully explore the area’s many natural delights including walks to the Canyon of the Waterfalls and Kom Peak. It feels as though little has changed in Rhodope over the centuries; the forests and mountains here support incredible natural biodiversity and are home to brown bears, wild goats and wolves as well hundreds of incredible wildflower and bird species. The villages and towns of the scenic Pirin Mountains are your next base and here you have caves, monasteries and mountain trails to explore as well as the added bonus of wine tasting in Melnik, famed for its local tipple. The region get its name from Perun, the Slavic storm god and the landscape is certainly dramatic enough to be the abode of the god of thunder and lightning. Although this is only second highest mountain range in Bulgaria – that accolade goes to the Rila Mountains - there are over a hundred 2,000m high peaks in the Pirin range making for some superb Alpine walking. Travelling on through the Rila Mountains, you stop at the spectacular UNESCO World Heritage Site of Rila Monastery before finally reaching Sofia. Here your journey comes to a close with a walking tour of this laid-back city’s flamboyant gold-capped and onion-domed churches and other cultural sights. Meal arrangements: 9 breakfasts, 8 lunches, and 9 dinners. Fly to Sofia. Transfer to hotel in Plovdiv. Walking tour of Plovdiv. Drive to Bachkovo Monastery. Walk within nature reserve. Drive to Smolyan. Canyon of the Waterfalls walk. Visit to Regional Museum of History in Smolyan. Transfer to Arda village. Walk in Rhodope Mountains around Arda village. Short walk around Shiroka La. Transfer to Trigrad and visit Devils Throat Cave. Walk to Yagodina and then drive to Buinovo. Visit Yagodina Cave. Transfer to Delchevo. Afternoon walk in the Pirin Mountains. Transfer to Rojen and visit monastery. Walk to Melnik and explore. Transfer back to Rojen. Walk among Stob Pyramids. Transfer to Rila Monastery. Walk to the grave of St Ivan Rilski. Drive to Sofia. Sightseeing tour of Sofia. Transfer to airport for flight home. 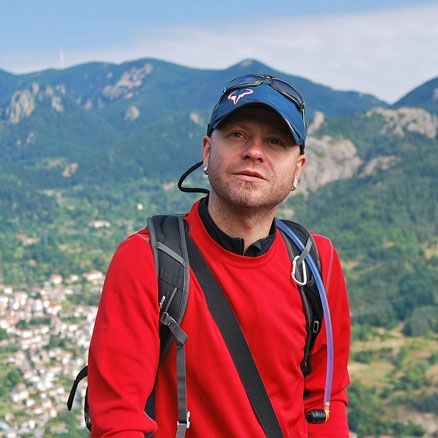 Our Gentle Walking Bulgaria trip will be led by Velislav Kasamov who speaks excellent English and knows the area well. Velislav was born and raised in the Rhodope Mountains before moving to Plovdiv. He graduated from the University of Plovdiv with a masters degree in 'Social and cultural tourism', and for his thesis he studied the Central Rhodope Mountain area having been inspired by the unique geography and anthropology of his home town region of Smolyan. Velislav still lives in Plovdiv and works as a guide not only in the region but throughout Bulgaria. Among his interests are history, hiking and biking and photography and he loves nothing more than to lead tours that combine culture, history, outdoor activities, stunning panoramic views and amazing natural sights - dedicated to great overall experience. Day 1 - Fly to Sofia. Group transfer to hotel in Plovdiv - 120km, 2 hours. Today you will fly from London to Sofia Airport. On arrival you will be met by your guide for the two hour group transfer to your hotel in the city of Plovdiv. On arrival at your hotel, your guide will provide an initial briefing on the arrangements for the following day in Plovdiv. You will have dinner in a local family-run restaurant in Plovdiv’s Old Town. Day 2 - Morning walking tour of Plovdiv. Transfer to Bachkovo Monastery. Walk within nature reserve. 6km. Transfer to Smolyan. Today you will spend the morning exploring Plovdiv, the 2019 European Capital of Culture. After breakfast you will walk from your hotel, first visiting a towering Soviet Army memorial, known as 'Alyosha', before then walking to the old Ottoman clock tower, offering panoramic views across the city. Following this you will visit Plovdiv's famous 'Old Town,' a great place to wander around and take in the city's cultural heritage. Whilst in the Old Town you will visit the remains of the Roman Amphitheatre and spend time looking around the Ethnographic Museum, which showcases an impressive array of local skills, including the making of wine and cheese, textiles, folklore traditions and music. You will be given some time at leisure to have lunch. After lunch you will transfer to Bachkovo Monastery in the Western Rhodope Mountains. This is Bulgaria's second largest monastery, founded in 1083. Despite often being popular among tourists, the atmosphere within the monastery grounds still remains tranquil, partly due to its romantic setting at the foot of the Rhodope mountains. After exploring the monastery you will walk in the neighbouring nature reserve. The route takes you along well maintained paths into forests abundant with spruce, pine and maple trees, to name a few. Along the way you will pass large waterfalls and traditional chapels; stop and enjoy a drink of clear water from the natural mountain springs. You will follow the same path back to the monastery. Day 3 - Canyon of Waterfalls walk - 10km, 5 hours. Afternoon visit to Regional Museum of History in Smolyan. Transfer to Arda village - 45 minutes. After breakfast you will have a short transfer to 'The Canyon of the Waterfalls,' where you will walk along the 10km eco-trail. The trail winds through part of the Soskovcheto Nature Reserve and the route is jam-packed with waterfalls, with the chance to see an incredible 46! One of the most impressive sights you will see is a waterfall, named after the musician, Orpheus, who used to live in the mountains. This stunning work of nature stands tall at 68 metres, and can be both seen and heard from many different parts of the trail. You will also have a couple of opportunities to climb up to viewpoints, offering amazing panoramic views including your first proper view of the Rhodope Mountains. You will stop for a picnic lunch at a picnic area along the trail. The forest is decorated with many large rocks which all have unusual and unique shapes, formed by thousands of years of weathering from the water. After your walk you will have a short drive back to the village of Smolyan, to visit the Regional Museum of History. This is one of the most culturally rich museums in Bulgaria, therefore offering an unmatched insight into the extensive history of the Rhodope region. The museum is split into two sections, Ethnographic and Archaeological. Accompanied by a knowledgeable guide you will have plenty of time to explore and learn about the many impressive artefacts on display, including the Thracian period, which features a Thracian helmet on display. You will also learn about an elaborate array of traditional crafts such as wood carving, weaving and the production of traditional costumes, before stepping into the musical world of the Bulgarian folklore culture. Day 4 - Walk from Arda village to the springs of Arda River - 15km, 6 hours. After breakfast your walk will begin from the door of your hotel. After following an asphalt road for 15 minutes weaving through traditional houses, you will reach the end of the village and be completely surrounded by the towering mountains of the Western Rhodopes. The first part of your walk is a fantastic first look at the versatility, yet tranquillity of the Rhodope Mountains. You will be taken along mountain paths, through fresh spruce tree forests and verdant meadows, carpeted with wild flowers. Along the route there is the opportunity to drink from fresh mountain springs. After around two hours of walking you will reach a house where you will stop for a drink and a small break to relax on the veranda, taking in the stunning views. After bidding the locals farewell, you continue your walk through forest along a slowly ascending path to reach the springs of Arda River. The Arda River is longest river in the Rhodope Mountains at 290km, passing through both Bulgaria and Greece, with 229km on Bulgarian territory. Upon reaching the river springs you will have a traditional lunch prepared for you by a local, where you will also have the chance to relax and take in the beautiful surroundings. After lunch the route continues through both forests and meadows before reach a small collection of buildings that have been constructed to resemble a theme park. As you meander through the traditional Rhodope style architecture you will have the opportunity to stop and admire this quirky creation. You will then take a short path down to meet the bus for a transfer back to your hotel. At dinner you will have a tasting of homemade fruit wine. Day 5 - Walk from Arda village to Kom Peak - 5-6 hours. Today your walk will take you to Kom Peak. As before, you will begin walking from your hotel but head into a different area of the Rhodope mountains. Kom Peak stands tall at 1654m and can be seen from your hotel. Your walk passes through the pretty village of Gudevitsa which has a population of just 20 people. You will visit a small holy spring and continue to the peak. Upon reaching Kom Peak you will have ample time to enjoy the incredible views of the Rhodope Mountains and the nearby villages before returning to Arda on foot. Day 6 - Short walk around Shiroka La village. Transfer to Trigrad and visit Devil's Throat Cave. Walk to Yagodina. Transfer to Buinovo. After breakfast you will transfer to Trigrad village. En route you will stop at the pretty mountain village of Shiroka Laka, home to one of Bulgaria's most renowned folklore schools and a fantastic array of traditional Rhodope architecture. You will have a short walking tour of the village which will showcase a handful of some of the 60 plus preserved National Revival-period houses. You will also visit the Church of Assumption, which was constructed in less than 40 days and is filled with stunning frescoes and icons. Your time in Shiroka Laka is also a good opportunity to buy some handmade souvenirs. From Shiroka Laka it is a short drive to the dramatic Devils Throat Cave, an amazing work of nature. The cave is reached on an underground concrete walkway which opens out into the 'throat' which is home to the highest underground waterfall in the Balkan Peninsula. You can either retrace your steps from here, or for the adventurous, continue up a staircase of 300 steps to reach a viewpoint where the Trigradska River goes underground. A short transfer will take you to the beginning of your next walk from the village of Trigrad. This walk takes you through spruce tree forests and alpine meadows to the border of Yagodina village where you will be met and transferred to your hotel. There are far-reaching views across meadows bordered by forests which can be enjoyed from the hotel over your evening meal. Day 7 - Visit Yagodina Cave. Transfer to Delchevo village. Pirin Mountain walk - 2 hours. After breakfast you will pay a morning visit to Yagodina Cave. The cave is 275,000 years old and spans over 10km, with a 1km stretch open to the public. You will have a tour lasting between 45 mins and 1 hour, with your guide translating the narrative as you go. Yagodina Cave is famous for a range of different formations, including stalactites, stalagmites and cave pearls. There is also a distinctive section of the cave which has been naturally formed resembling leopard skin. Inside the cave it is cool and humid so it is important to dress appropriately. After your visit to the cave you will transfer to the small yet beautiful mountain village of Dechevo. En route you will stop in the neighbouring city of Goste Delchev for lunch in a local restaurant. Upon reaching Delchevo village you will have a short afternoon walk into the Pirin Mountain range. Although this walk is shorter, it is no less spectacular, as you walk to the top of a small peak which rewards you with wide reaching views of the plateau separating the Rhodope and Pirin Mountain ranges. The route follows rocky mountain trails before reaching a shady glade, the gateway to the summit. Once reaching the top you will have plenty of time to admire the amazing views and take lots of photos! On your return to Delchevo there is time at leisure before dinner to explore the characterful village, following along its cobbled streets between traditional mountain houses. Day 8 - Transfer to Rojen village and visit monastery. Walk to Melnik and explore. (2-3 hours). Transfer back to Rojen. This morning you will transfer to Rojen Monastery, just south of Melnik which is the smallest city in Bulgaria and famous for its wine production. Rojen monastery is much less imposing than other bigger Bulgarian monasteries, offering a tranquil atmosphere and great views from the wooden balconies down over the entire courtyard. An unusual, yet endearing feature of this monastery is the old vine trees situated in the courtyard which are decorated with white grapes. After spending time looking around the monastery you will begin your walk to the city of Melnik. You will have a short walk uphill along the sandstone pyramids which guard the city. Here you will have chance to stop and admire the many gorgeous views. This walk is also excellent for showing the contrast between the desert like landscape of the sandstone pyramids and the bustling, cobbled street city of Melnik. After descending from the pyramids you will follow the path of a dried up river bed, which is the perfect place to see different types of butterflies. The path leads you right into Melnik where you will enjoy lunch at a traditional Bulgarian restaurant. After lunch you will have a walking tour of the city. First you will climb for around 15 minutes to reach a plateau offering the best views of Melnik, before visiting Kordopulov, an impressive house built by a rich wine merchant in 1754. After looking around the house you will be taken into the wine cellar where you will have the opportunity to sample some of the local wine which the city is famous for. After your tour you will have some time at leisure to explore the city and maybe some wine! You will then have a short transfer back to Rojen where you will have dinner and stay overnight. Day 9 - Walk among Stob Pyramids. Transfer to Rila Monastery. Walk to St Ivan Rilski grave. Transfer to Sofia. Walking time 2-3 hours. Today you will move on to Sofia, Bulgaria's capital city. Along the way you will stop at the Stob Pyramids for a short walk. The Stob Pyramids are a natural phenomenon where the landscape has been shaped into different striking formations, some topped with stones. A legend says that the pyramids are all wedding guests who have been stunned, as the bride was so beautiful that the best man tried to kiss her. Your guide will take you along the paths on the edge of the pyramids up to a view point. You will then drive on to Rila Monastery in the heart of the Rila Mountain range. The monastery is an UNESCO World Heritage Site and is the biggest monastery in Bulgaria. It is set among a backdrop of wild mountains, which combined with the colourful architecture will leave you in awe at its beauty. The founder of the monastery was St Ivan Rilski, who was known as a very wise man possessing special healing powers. He is believed to have spent the last 20 years of his life in a small cave about an hour's walk from the monastery. After spending time at the monastery you will make the short walk to visit the cave. You will enter via the man-made entrance and be able to see where he slept. You will have the option to exit through the natural entrance, which is done by climbing on rocks up through a small gap. It is widely believed that if you can exit this way without help that your sins will be washed away. Please note the climbing exit is optional. Next you transfer to your hotel which is on the outskirts of Sofia for dinner and overnight stay. Day 10 - Sightseeing tour of Sofia. Group transfer to airport for flight home. This morning you will have a walking tour of all of Sofia most iconic features. This will include, a visit to Sv Aleksandur Nevski Memorial Church, which is one of the biggest and most visible buildings in Bulgaria. Transfer to Sofia airport for your flight to London. This was my first recce trip and it didn’t disappoint. Bulgaria has so much to offer the keen traveller, I feel like I have only just scratched the surface. Its rich history was so interesting to learn about and interspersed with exciting mountain walking, this trip really is a great way to discover this emerging Balkan nation.